Google added a new antivirus software to Google Pack and this time the program doesn't try to convince you to buy a paid version. Google Pack added the free version of the Avast antivirus, but only for the following languages: French, German, Italian, Czech, Spanish, Russian, Portuguese, and Polish. 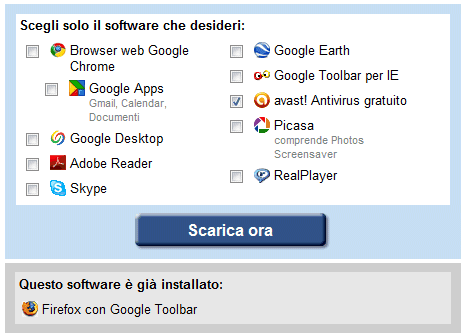 I installed the software using the Italian interface, but both Google Pack and Avast were installed in English. For some reason, the English version of Google Pack lets you install a different security software: Spyware Doctor with Anti-Virus, which replaced Norton Security Scan. Both Spyware Doctor and Norton Security Scan offered limited or no real-time protection and Spyware Doctor used an outdated signature database. "The Avast Free Antivirus included in the Google Pack is the same as our regular Avast Free Antivirus. Following the philosophy of Google and Avast, the product is fully featured and does not constantly try to up-sell users to a premium product," explains Vincent Steckler. The most recent tests from AV-Comparatives.org show that Avast, Avira and Microsoft Security Essentials are the best free antivirus software. "This year, avast! showed big improvements in its detection rates (esp. in the second half of 2009) and reduced its number of false alarms. Its on-demand scanning speed is one of the fastest. 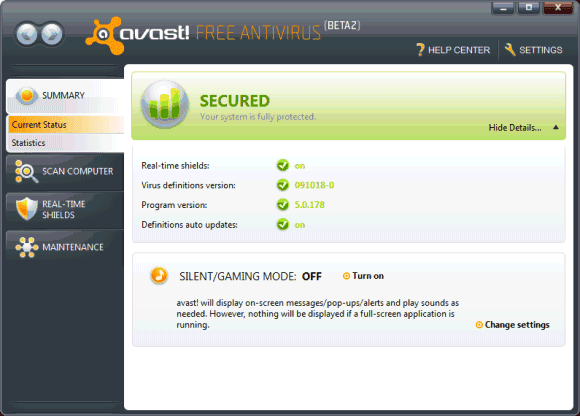 The recently released avast! v5 includes further enhancements (like a new graphical user interface) and new protection features." 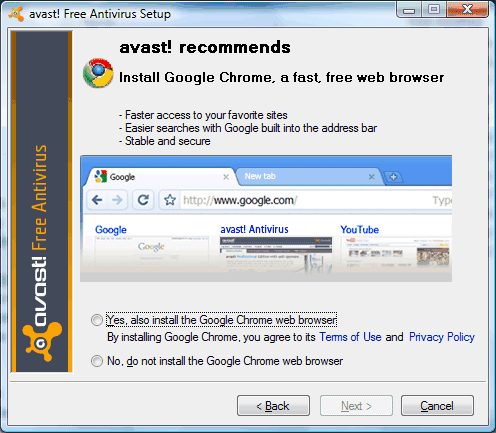 In December, Avast's blog announced that the software will offer users the option to install Google Chrome. Some may call it software bundling, but it's not as disingenuous as the Google Earth promotion. "Starting in mid-November, we will be giving our new users an option to install Google Chrome when installing Avast. We are not forcing Chrome on users. It is entirely up to the user–to download/install and nothing is hidden." Google always provides best to its user. Is this the same as the free Avast 4.8 home edition anti virus available from www.avast.com ? I'd download it just because of the fact that Google are promoting it, except that Real Player is also in the list. The list of programs that are installed is customizable, so you can pick your favorite software. For some reason, Google Pack added the beta version of Avast 5, while avast.com lets you download Avast 4. If you don't want to install Google Pack, you can use this direct download link: http://files.avast.com/files/beta/5.0.366/setup_av_free.exe. I've never tried Avast. I've been riding on the AVG band wagon for the past few years. Should I switch? AVG has a high rate of false positives, so it frequently finds "infected" files from legitimate applications. A search for [avg false positive] shows plenty of examples. "When I booted up this morning AVG warned me that my Google Desktop had been infected with the vundo trojan and had moved the infected file to the vault. I uninstalled the program and then searched for more info on the net and came across messages on this forum about false positives." "An update for the AVG virus scanner released yesterday contained an incorrect virus signature, which led it to think user32.dll contained the Trojan Horses PSW.Banker4.APSA or Generic9TBN. AVG then recommended deleting this file; this causes the affected systems to either stop booting or go into a continuous reboot cycle. So far, the problem only appears to affect Windows XP, but there is no guarantee that other versions of Windows don’t have the same issue." Yes, Yes, Yes!! Swich to Avast! It is simply THE best! I can't speak for the comparative effectiveness of Avast and AVG in detecting and eliminating viruses.. but, it seems to me that Avast slowed down my computer more than AVG did.. It annoyed me and I uninstalled it and reinstalled AVG, which I've had good luck with for several years... BUT.. I'm still open to changing my mind. Depending on the reports I see from you folks on this subject, I still might try Avast again... I kind of liked its looks,.... for all that looks are worth. Yeah, Microsoft Security Essentials pulled 4 viruses off my cousin's computer that was running up to date Avast. I could never see myself using their crap. The only pro it has is the boot time scan that might catch some things. Avast is really the best AV I've ever used. Commercial or freeware. I'd suggest you test some infected files on virustotal.com in order to compare different AV programs. Avast to me gives the best results, together with Kaspersky. Still, AVG is really good, but I don't like its intrusive interface. Thank you for removing that idiot's posting earlier regarding all the Nike links. I wouldn't spit on a spammer if they were on fire. is avast good for a newbie? Right now, Avast is probably the best free antivirus for Windows. If you don't like it, you can try AntiVir and Microsoft Security Essentials. Wake up people, Google is playing a monopolization game that will cost us a lot! They are filtering now everything you see, they are between you and the real web. Now they have a browser. Don´t you see that is too much control for one company. They also have 70% of firefox and make them put google as the home page. Now avast does the same with the browser. So Google decides what page you can reach and what page you can´t reach, they control your perception of the web. How Get Avast Antivirus With Free License Key For lifetime?